These accessory items are used to match a laser diode to a pulse generator, by providing an internal series resistance (typically 50 Ohms) and a very high bandwidth socket for the user's diode. A bias-tee circuit is also provided internally. 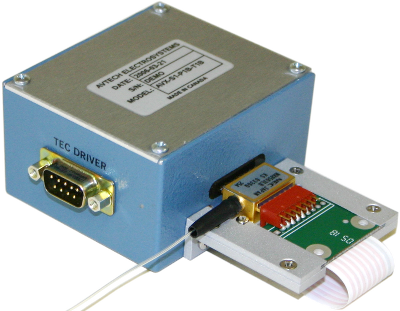 Every AVO-9 laser diode driver includes one of these AVX-S laser diode bias insertion units (also called "output modules"). Output modules can generally be swapped, to permit a single pulse generator to handle a variety of diode packages and configurations. Inverting transformers can be installed to invert drive polarities. These modules are often customized to match particular diode packages and V/I curves.